Leo Johnson was a star athlete in four sports at Millikin University and left school in 1919. 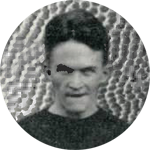 He is pictured in the 1920 Staley football team photo yet never played in any game. However, he spent his entire life associated with sports and became one of the most lauded coaches in the history of college track and field. Johnson grew up in Carlyle, Illinois, but little is known of his life before he came to Decatur. In 1915, at age 21, he enrolled at Millikin University and immediately became the starting quarterback on the football team. At only 5 feet 5 inches tall, “little Leo” or “Little Napoleon” played guard on the basketball team and shortstop on the baseball team while also setting the conference record for long jump (22 feet, 4.5 inches) on the track team. He again lettered in four sports during the 1916-1917 seasons before entering the Reserve Officers Training School at Fort Sheridan, IL in June 1917. After two months of training he was assigned to Camp Grant (Rockford, IL) as a bayonet instructor before sailing to France in August 1918 to join the 35th Division of the U.S. Army. After World War I ended in November, Johnson remained on duty in France and participated in the long jump in the 14-nation Inter-Allied games in Paris in July 1919 before returning home. He was discharged at Camp Grant on August 16 and was back at starting quarterback for Millikin two weeks later and led the team in scoring that season. After participating in baseball and track again in 1920 Johnson and five other former Millikin players decided to give professional football a try instead of returning to the university that fall. Save being photographed in uniform with the Staley team in October 1920; there is no record of Johnson appearing in any regulation game or of even getting paid. However, he always was invited to future Staley/Bears reunions and always considered himself part of the team. In the fall of 1921, Johnson worked as the assistant football coach at Millikin before coaching at Bradley University the next two years. In September 1924 he returned to Millikin as head football coach and through the 1937 school year also served at various times as head basketball coach and athletic director. He received his bachelor of science degree from M.U. in 1933. On May 12, 1937, 250 sports fans gathered at the Decatur Masonic Temple to honor Johnson at a farewell banquet sponsored by his college fraternity, Sigma Alpha Epsilon. The keynote speaker was none other than Chicago Bears owner and coach, George Halas. It was Halas’ first visit back to Decatur since his Staley football days. In addition to having played with and been coached by Halas in 1921, Johnson coached now Bear running back George Corbett at Millikin as well as future Hall of Famer and current Bear great, lineman George Musso. Johnson was hired away from Millikin by the University of Illinois to serve as assistant football coach and head track coach. From 1938 until his retirement in 1965, Johnson’s track team won three NCAA championships and 17 Big Ten championships: ten outdoors and seven indoors. He served as the head coach for the U.S Pan American track team in 1955. Before his death in 1982 he was selected to the Millikin Athletic Hall of Fame, the United States Track and Field Hall of Fame, the Helms Hall of Fame and the Drake Relays Hall of Fame. At his passing the Leo T. Johnson Track and Field Scholarship Fund was created at the University of Illinois and the A.E. Staley Company was front and center with a $500 donation for their former player. On December 5, 1922, Johnson married former Millikin classmate Henrietta Page at her home at 570 W. Prairie Ave. in Decatur. They had two sons. At his death on March 13, 1982, he was survived by his wife and sons Dr. William Johnson of Champaign and Dr. Gerald Johnson of Monticello, IL. He was interred just east of the UIUC football stadium at Roselawn Cemetery in Champaign.